What do I need to pack for my Canada trip? Canada is a vast and beautiful place with all kinds of things to do and several variations in climate due to the country’s large size. This can make it hard to know how to plan for your trip. I often get asked what to wear in Canada, what to pack, what NOT to bring, and many other questions. This list should help! Below is our guide to packing and enjoying Canada, no matter when you’re traveling. As always, bring your patience, your flexibility, and your sense of adventure. 1) Beanie – There’s a reason the beanie (or touque, as the Canadians call them) is a staple in the Canadian wardrobe: the temperatures can be erratic! It might be hot and sunny during the day, but by evening it could be snowing. A beanie is a fashionable, and cozy accessory that will help you stay warm in any weather scenario. 2) Travel Insurance for Canada – Travel insurance is too critical to overlook, even when visiting a country as safe and secure as Canada. You never know when you might slip on black ice, or sustain a hockey-related injury. Anything could happen (even though it probably won’t), so protect yourself! 3) Scarf – An oversized scarf is a friendly addition to any outfit in Canada. You can use it as an alternative to a jacket, or in addition to a coat, depending on what the weather is doing! It’s perfect for brisk spring days when it can be worn as a fashionable alternative to outerwear. 4) Long underwear Women’s and Men’s – Long underwear is the perfect way to stay warm during the colder seasons in Canada. If you’re planning to do any skiing, camping, or hiking, it will be especially helpful! You’ll never have to worry about feeling chilled when you’re armed with long underwear. 5) Binoculars – Canada is notorious for its mind-boggling scenery, and wildlife. A pair of binoculars is essential for ensuring you get to see everything up close and personal— while still maintaining a comfortable distance. 6) Wool socks – Wool socks are another one of the secrets to staying warm in Canada. When your feet are warm so is the rest of your body. These socks are breathable and compact. Wear them inside boots or sneakers for extra warmth on chilly days; it’s so much easier than carrying a jacket around. 7) Water bottle – The tap water is drinkable in Canada, so why waste money on bottles of water (which only serve to harm the environment) when you can just refill your own for free! This option from HydraFlask won’t leave a plastic taste in your mouth, and it will even help keep your water cool on warm days. 8) Portable Lipstick-Sized Charger – These devices are a traveler’s best friend. You never have to worry about being stranded without a camera or phone battery. You also won’t have to spend time searching for free outlets in crowded coffee shops when you’d rather be sightseeing: just throw it in your bag and go! 9) Swimsuit: Men’s and Women’s – If you’re not visiting Canada in the summer, it might seem counterintuitive to bring swimwear, but you should! You never know when you might come across thermal springs that you need to explore! It would be a shame to miss out on a natural wonder like hot springs just because you overlooked bringing swimwear… so don’t! 10) Toiletry bag – You can never go wrong with a hanging toiletry bag in your pack. Keep all of your toiletries in one, easy to access place for when you need them. Best of all, when you need to pack up, all you do is zip it shut! 11) Thermal vest – Layers are your best friend when it comes to visiting Canada. The temperature can fluctuate significantly throughout the day due to rain, fog, wind, or shade, so it’s always best to be prepared. A thermal vest is a great way to stay warm (but not too warm!). 12) Travel pillow – Regardless of where you go in Canada, you can expect to travel long distances. It’s a vast country after all! A travel pillow will keep you comfortable and rested during your journey. 13) Action camera – A waterproof action camera will help you capture all of the beautiful moments from your trip to Canada. You’ll be glad it’s waterproof, so you never have to be concerned about rain, snow, spray from a waterfall, or whatever form of humidity Canada decides to throw at you. 14) Rain Jacket – Even in the summer, Canada’s weather can be wet and unpredictable. A raincoat is sure to be a welcome addition to your pack. If you don’t experience rain, it will also protect you from wind chill. 15) First aid kit – It’s always wise to pack a first aid kit, but especially if you’re planning to visit the Great Outdoors. Take one of these kits when you’re hiking, and keep one in your rental car in case of emergency. 16) Head lamp – For adventurous travelers, a headlamp is really handy. It allows you to have your hands free to help you navigate your way in the dark. It’s especially great for camping; if you have to start a fire, or set up a tent in the dark, it will be much easier to do if you have use of both hands. 17) Packing cubes – With so many different temperatures and activities to pack for, it’s bound to be a challenge to fit all of your clothes and gear into your luggage. Packing cubes will help you condense your items, as well as organize them. That way, you only have to take out what you need. It really simplifies packing and re-packing! What should I wear in Canada? When visiting Canada, it’s crucial to consider the time of year you’ll be going. However, while Canada does have 4 distinct seasons, you can experience beautiful or horrible weather during any of them. On top of that, this is a large country, and each region has its own distinct weather patterns. Be sure to take the area you’ll be visiting into account when packing for your trip. Generally, though, it’s always best to come prepared; pack a few items to layer (or un-layer) regardless of what time of year you visit. Of course, you’ll also need to consider what types of activities you’ll be doing during your trip. If you’re planning to spend a lot of time outdoors, pack hiking or sports clothing. You’ll want something breathable and quick to dry, as it can be humid in Canada. The most important thing to remember when packing for Canada is to take layers. You really need to be prepared for anything. You can never go wrong with jeans, t-shirts, sweaters, fleece jackets, and raincoats. What should WOMEN wear in Canada? Women in Canada tend to wear comfortable, stylish clothing that errs on the casual side. Think, jeans, blouses, sweaters, and boots, with trendy outerwear overtop. In big cities, it is more common for some women to wear formal clothing, but in small towns, most women stick to casual outfits. When visiting Canada, dress with comfort and practicality in mind first, and fashion second. You will fit in best in jeans or leggings paired with boots or sneakers, a sweater, and a stylish rain or snow jacket. Chic heeled booties or a pea coat can dress up any outfit, while still protecting you from the elements. If you’re planning to do any hiking, camping, or other recreational activities, it’s best to pack activewear for those activities. Nylon hiking pants, breathable synthetic tops, and polar fleece sweaters are all staple items. Always think in layers when dressing for Canada, as the temperature can fluctuate widely at any time of year. What should MEN wear in Canada? The attire of Canadian men is widely stereotyped to consist of jeans, a plaid shirt, and a toque (beanie hat). While it is indeed a stereotype, you certainly wouldn’t look out of place in such an outfit anywhere in Canada. Typically local men dress in jeans and a button shirt paired with a sweater, a jacket, and either boots or sneakers (depending on the season). Jeans are always a safe staple item in your wardrobe for Canada. You can dress them up with a button shirt and a stylish jacket, or down with a t-shirt and sneakers. In cities, there is undoubtedly more cause for dressing up, though it is never vital. You will look right at home in jeans and a t-shirt anywhere you go. A fleece jacket is always a sensible choice for extra warmth under your rain jacket. Spring (March, April, May) – Canada’s spring typically brings lots of rain mixed in with sunny days. Occasionally the temperature will even be high enough to warrant wearing shorts, but generally speaking, jeans, t-shirts, and sweaters are the ideal spring attire. Of course, you always need to be equipped with rain gear as well. A fleece jacket is perfect for keeping warm on brisk days and can be worn with a rain shell to shield you from the water. If it happens to be hot and rainy merely wear the rain shell without the fleece! As you can see, dressing in layers is critical in Canada. When it comes to footwear, waterproof boots, whether they be rubber or leather, are ideal in the spring. Summer (June, July, August) – Summer is the most magical time of year in Canada. The days are extra long and often warm. Though, there can be the occasional summertime bout of fog, wind, or rain, particularly on the coasts of the country. Be sure to pack light layers when visiting Canada during the summer. Shorts or jeans paired with a t-shirt will be perfect most of the time. In the interior provinces, you’ll experience much warmer temperatures; shorts and sundresses are definitely in order for those locations. Don’t let the warm weather lull you into letting your guard down though, as spontaneous rain showers or foggy days are not unheard of. Come armed with fleece jackets or a thick flannel shirt, and a rain shell to protect you in case of emergency. Fall (September, October, November) – Fall in Canada is usually pleasant and often is just an extension of the summer weather. However, it can be rainy and cold, especially as November draws near. Expect warm, pleasant days, and chilly nights. Fall is when you can begin to transition your go-to footwear from sneakers to boots. Thick socks will keep your feet cozy on chilly days, and a fleece sweater will usually be a sufficient outer layer, as long as it isn’t raining. Winter (December, January, February) – Winters in Canada are no joke. You can expect, snow, ice, sideways rain, or a combination of the three, depending upon which region you’re visiting. Winter on the prairie provinces tends to be cold, but sunny, and with lots of snow. Meanwhile, the east and west coasts are more humid and experience a combination of rain, snow, and ice. Regardless of where you go, always pack warm layers to survive the Canadian winter. Wool socks and sweaters, jeans, fleece jackets, and of course a rain or snow jacket are all essential. For footwear, boots, or sneakers worn with thick socks are your best bet. Gloves, scarves and wool toques will offer additional protection from the elements. Though cold, winters can be sunny, so come prepared with sunglasses to shield your eyes — especially if there is snow on the ground. Hiking/Recreation – Canada’s impressive wilderness draws tourists from all over the world who want to experience the incredible scenery first hand. If you’re one of them, be sure to come prepared. A run of the mill visit to a national park doesn’t require specialized equipment, because the majority of the trails are manicured. However, it’s always wise to wear waterproof hiking boots and lightweight hiking pants. A daypack comes in handy for carrying water and trail snacks. Skiing – There are many world-famous ski hills in Canada which draw visitors through the winter and spring. Always be sure to pack appropriate cold weather clothing when skiing. You’ll want flexible, waterproof ski pants, an athletic, moisture-wicking top, and warm outer layers. On unusually cold days, long underwear will be a welcome addition to your ensemble. Around Town – While nature is likely the first thing that comes to mind when Canada is mentioned, the country always features world-class cities, like Vancouver, Toronto, and Montreal. When exploring Canadian these large cities, dress in fashionable but casual clothing; leather boots, jeans, and a stylish outer layer will have you blending right in. For women, a crossbody purse with room for an emergency umbrella is ideal. Dining Out – While most restaurants won’t mind casually dressed patrons, it’s always wise to bring a more formal outfit for fine-dining experiences. For women, a dress, or dark jeans paired with a cute sweater is appropriate, and for men, dark jeans, a collared shirt, and a blazer is ideal. 1) Excessive toiletries – Canada has plenty of well-stocked drug stores where you’ll be able to pick up just about anything you possibly ever need — even in remote locations. Things like sunscreen, hand lotion, and even shampoo and conditioner just take up excess space in your pack. Plan to purchase these items upon arrival and save yourself the extra weight. 2) Tons of cash – It’s really unnecessary to carry excessive cash when traveling within Canada. The vast majority of businesses will accept credit cards, and for those that don’t, there’s typically an ATM nearby. 3) Don’t overpack – When packing for Canada it’s easy to go overboard piling sweater after sweater into your suitcase. However, the key to packing for Canada is to bring a few versatile pieces that can be layered in different combinations. A fleece sweater, a wool sweater, and a rain jacket are the essential warm layers. 4) High heels – It’s highly unlikely that you’ll have an occasion to wear high heels on vacation to Canada. Even if you are visiting a big city, heels just aren’t that practical as you’re liable to be walking long distances. Instead, pack practical, comfortable shoes that will keep your feet warm and cushioned. 5) Books – With the increasing popularity of e-readers, there’s really no need to pack around heavy books when you travel. Instead, opt for a Kindle and download a selection of titles that you might like to read on vacation. A Kindle takes up far less space in your luggage, and ebooks often retail at a lower price than paperbacks. 6) Money Belt/Fanny Pack – There’s nothing really wrong with bringing a money belt to Canada, other than the fact that it will make you stand out as a tourist. Canada is a very secure country, and petty theft just isn’t that common, so money belts aren’t really necessary. They’ll only serve to remind everyone around you that you’re a tourist. Instead just avoid carrying large amounts of cash, and mind your pockets, or use a hidden carrying pouch that isn’t obvious when you have to access it. While French is Canada’s official second language, it is not spoken by all Canadians. The French-speaking population of Canada is concentrated in the east of the country, near Quebec. You will encounter some people in other areas of the country who speak French, but it is not the norm. Do I need to tip in Canada? Tipping is expected in Canada. It is reasonable to tip 15 – 20% on meals. You are liable to be prompted to tip in many other scenarios as well, including taxis, coffee shops, hair stylists, tour operators, and more. In these instances, the amount of the tip is left entirely up to your discretion. Am I likely to see wildlife? Whether or not you spot wildlife really depends where you visit in Canada, however, generally speaking, wildlife sightings are common. While you shouldn’t expect to see any large animals in major cities, there is always the possibility of spotting something in natural areas. 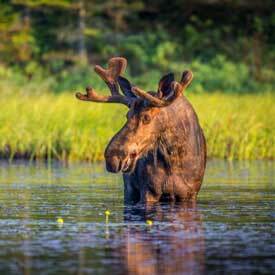 Canada is known for bears, wolves, mountain lions, deer, beavers, moose, caribou, and more. Is it always freezing in Canada? While Canadian winters are typically quite cold, the summer months are actually quite pleasant. Of course, the temperatures will be dictated by your geography, but in most places in Canada, you can expect average summer temperatures of 23 degrees and higher (in some places MUCH higher, up to 40 degrees). What’s the best way to travel within Canada? Because Canada is such a massive country, it’s easiest (and likely cheapest) to travel by rental car. Within big cities, there are reliable public transportation systems, but in smaller towns, public transportation is usually lacking; plus, waiting for a bus isn’t particularly fun when it’s raining or snowing outside. If you’re traveling between cities or provinces there are buses, and sometimes trains, but travel by these methods isn’t particularly comfortable, and it can be surprisingly costly. Renting a car is the most efficient, and the best way to travel because it gives you the flexibility to visit harder-to-reach locations, which also tend to be the most impressive! What is a signature Canadian dish that I need to try? Canada’s most widely known delicacy is probably maple syrup, which is a tasty complement to pancakes or french toast in the morning. However, if you’re looking for something truly and uniquely Canadian, you must try poutine. This greasy dish composed of french fries drizzled with gravy and topped with cheese curds may be the world’s best hangover food. Try it at least once during your visit, just to say you did! What is the best time of year to visit Canada? The absolute best time to visit Canada is the shoulder season: Spring, or early fall (after Labor Day). In these times you’re bound to experience the best weather, the best prices, and the smallest crowds. Canadian schools let out for the summer, so popular destinations become flooded with tourists, both national and international. If you visit during the shoulder seasons, you’ll have a much more peaceful vacation. That said, be sure to do your research before committing to a shoulder season visit, because some attractions are closed in the off-season.